Classic Comedy Scripts are representing the works of Ray Galton and Alan Simpson as well as 'Up Pompeii' by Miles Tredinnick specifically for the stage. 'Up Pompeii' was adapted to the stage by Miles Tredinnick and has just become available through this office. Please see the 'Up Pompeii' page for full details. The TV episodes of Steptoe and Son are currently being adapted to the stage by Ray Galton, Alan Simpson and David Pibworth in association with Tessa Le Bars Management. See 'Best Episodes To Stage' page for scripts immediately available. Some of the scripts are more adaptable to the stage than others, and your choice may be related to your set design. One of the best ways to decide which is appropriate is to watch the episodes, all of which are available on a DVD box set which is available from Amazon and other outlets, and worth buying just to enjoy in any case! The episodes range between just the 2 main actors and fairly large casts. Some of the two hander episodes could be performed in small venues, and we will be adding sample set designs to this web site in the future. In the current recession playing Albert and Harold Steptoe could be the way to a bright new future. If you have been made redundant what better form of unemployment insurance could you have than to take your dramatic performances of Steptoe and Son to local theatre audiences who would be willing to pay to see you in such classic Steptoe episodes such as The Desperate Hours. Indeed the best form of Income Protection is to have a second opportunity should you find yourself out of work. Your personal creation of Albert Steptoe could be such an opportunity. So, look to 'Steptoe and Son' for your next production and captivate your audience with some of the most brilliant and influential British comedy ever written. 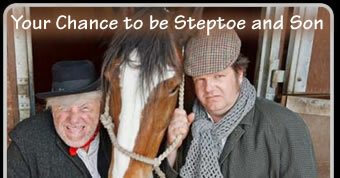 The MK Theatre of Comedy present 'Steptoe & Son' for 3 nights only. The company are well known for their sell out productions of 'Allo, Allo', 'The Ladykillers', 'Ripping Yarns' and 'Fawlty Towers'. For groups who are interested in producing 'Steptoe and Son' this is the perfect opportunity to come along and chat to the production team including David Pibworth who is working with Galton and Simpson to bring the scripts to the stage. The three episodes chosen have been specifically for their diversity in production. 'The Bird' is a two hander with only Harold and Albert appearing in virtually one set. 'The Desperate Hours' is a four hander with two robbers breaking into the Steptoe house, where you can see the interaction between the four of them in this sharply written and edgy episode. 'Oh, What A Beautiful Mourning' is more of an ensemble piece, where father and son attend 'Another Bleeding Steptoe Funeral' and a set outside the Steptoe house is used. For those keen to play the part of Albert Steptoe the good news is that Albert’s heart condition doesn’t feature too prominently in these episodes and you will not find yourself needing to feign countless heart attacks. This is probably just as well as there are bound to be a few insurance salesman in the audience who will try to sell you heart attack life insurance against your will. The entire team (Ray, Alan, Tessa and David) are very much of the view that these scripts should be affordable for all companies to perform and we look at each request to perform on an individual basis and are happy to negotiate a fair fee dependant on the size of the venue and producing company. We are currently working on a scale of charges that will be appropriate. Playing Steptoe and Son may not make you rich but a well produced and performed production should make you a tidy profit, perhaps to put by for retirement. Unlike Albert Steptoe who had to scrimp and save all his life you could have sufficient funding to buy a pension annuity and a pension lump sum which Harold Steptoe would no doubt blow on The Bird, a new car and a holiday …. Without Albert Steptoe of course. MK Theatre of Comedy are producing 'The Bird', 'The Desperate Hours', and 'Oh What a Beautiful Mourning' because they build up from 'The Bird' establishing the characters, through the brilliant four hander of 'The Desperate Hours' to a more ensemble piece of 'Oh, What a Beautiful Mourning'. The last one has a long scene outside the Steptoe house, but this can be acheived Front of Stage at their venue. Photo's will be available on this site after the production in November 2011. Engine Shed produced 'Men of Letters', 'Robbery With Violence' and 'Seance in a Wet Rag and Bone Yard' where the action, more or less, takes place in the main Steptoe room. It also uses less actors than are required in 'Oh, What a Beautiful Mourning', so there are many reasons to look at different episodes depending on size of cast and size of stage area. Please feel free to phone us for any advice on your production of 'Steptoe and Son' as we are here to help.